We’re not going to get overly political here, but it’s fair to say that austerity has led to severe cuts in public services offered by the City Council. While the pressure is on to maintain essential services with much smaller budgets, Chorlton can no longer count on grants and subsidies in the way it once did. We need to make a decision as a community. If we want flower beds, community events and Christmases (including lights and a switch-on), we’ll need to find a way to fund them ourselves. We all need a bit of love in our lives, especially at this time of year. Whatever your relationship status, it’s time to love where you live – because it will love you back. Money spent locally stays local. It supports lively high streets and district centres. It improves consumer choice and provides local jobs and training. Local prosperity means better house prices, good schools and increased inward investment. Buy everything from chains and supermarkets and your money most likely clears off to drink cocktails in some sort of off-shore non-dom tax haven. It won’t even send you a postcard, let alone come back and visit. A huge thank you to everyone who kept it Chorlton this Christmas, buying bags and gift vouchers, shopping on our high streets and supporting our local economy all year. That said, Chorlton is for life, not just for Christmas. Chorlton Gift Vouchers are still on sale and valid all year. You may not need birthday presents, bedding plants and ice cream right now, but when the time comes, the vouchers will still be there for you. Buy from: Celebration Party Shop, Elliotts, Epicerie Ludo, Love Lucy Boutique, The Make It Shop, McQueen Independent and Unicorn. The Chorlton Map is here! Pick one up in pretty much any shop, bar, cafe or library. You may think you don’t need it because you live here, but think again. The map’s a great reminder of all the wonderful and tasty things on offer here in M21: you may find something you never knew about, or feel encouraged to try something different. You can also see which traders offer exclusive deals and discounts to TAG! card holders and save yourself a Chorlton pound or two. 30,000 maps have been printed, some are for Chorltonians; others will make their way out to other parts of town and beyond; promoting our area as a great place to shop, play and visit. 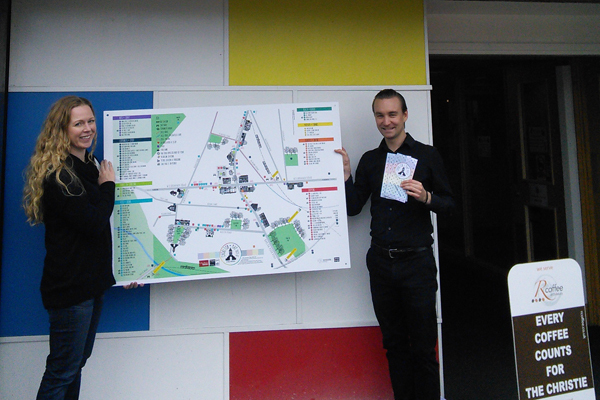 We’ll also be putting large maps at key points around the centre as a handy guide for visitors. Our update from the June edition of Community Index. June’s a big month for us – let’s hope for some lovely South Manchester sunshine! We’ve joined forces with Beech Road Traders and Community Index to create Chorlton Events a new calendar listing what’s happening in this place we call home. We want it to be an indispensable guide on what to do in Chorlton – from major cultural events to hidden-gem attractions on wet Wednesdays. Members of the two Traders Associations can email their events for inclusion We’ll promote the site through our members, through the magazine and through our wider marketing channels. You’ll find the calendar – a work in progress, but filling up fast – at www.communityindex.co.uk. There’s always something creative happening in Chorlton, but it’s in May that the party really gets started with Chorlton Arts Festival. We’re proud to be an official Festival Partner and that so many of our members help make it happen through staging events, supplying a venue and so much more. We love the way the festival brings visitors into Chorlton, as well as being a celebration of, and for, everyone who lives and works here. We’d like to say a huge thank you to festival director Ella and her team of volunteers, to the performers and the contributors – you all do us proud. Want to get the most out of Chorlton? As we speak, the new Chorlton Map is shaping up beautifully. More than 75 local businesses are featured, alongside community organisations, churches and other landmarks. Chorlton artist Anna Violet has been creating bespoke illustrations of selected members, some of which you can see here. The map is designed to attract visitors and promote Chorlton as a destination for shopping, nightlife and culture. It’s also designed to help residents discover things they may not have even known about. The map should find its way into shops, libraries, cafes and all sorts of other places from June. While we don’t have a Chorlton Pound (yet), we do have the TAG Pass It On scheme – the card which rewards your loyalty. For just five (ordinary British) pounds, you’ll get deals and discounts with loads of local traders. Whether you’ve got dresses, diamonds or daffodils on your shopping list, TAG gets you some cheeky discounts and even a freebie here and there. It’s all designed to encourage you to shop local and keep Chorlton interesting, which benefits everyone. New TAG members offering exclusive discounts include the Bosu Body Bar, Love Lucy, Bike Barn and Grays Larder. Pick up a card in shops displaying the TAG logo. It’s valid for the whole of 2015 and if you shop local, it pays for itself in no time at all. We have absolutely no idea why anyone would want to go into town…. It’s a busy time for Chorlton Traders. W’ve been working to help clean up, green up and generally tidy up Chorlton, in partnership with the City Council. The map is moving along nicely too. We’ve an independent business sector every part of Manchester would be proud of and we want to show it off ! Time to flash that TAG! New deals for the extra-fabulous on TAG! this month. Your local loyalty card will save you a sparkling 10% on pre-made diamond jewellery at Wilbrahams of Chorlton. Budget a little smaller? Enjoy 10% off all spends over £10 at Love Lucy, Beech Road’s new boutique. Pick up your TAG! card in any shop with a sticker in the window. It’s just £5 and pays for itself in no time – especially if you’re buying diamonds, darlings. No Chorlton summer is complete without Beech Road’s Family Fun Day, which takes place on Sunday 5 July 2015. Don’t forget Chorlton’s lovely markets in April. Art Market Open every day, Chorlton Precinct. We’re working with Beech Road Traders to create a free map that will list all the best and brightest Chorlton businesses. It will help residents, visitors and newcomers know the area better, find some hidden gems and understand just why we all love to call M21 home. The map will be not only be distributed in Chorlton, but also in the city centre and surrounding areas. The print run is 30,000. If you’d like your business to be listed, there are a number of different options. If you’re a home-based business, or run a market stall, a limited number of contact listings are just £45, but you’ll need to be quick. If you have premises that need to be marked on the map, rates start at £70. And because we want it to be a thing of beauty, the brilliant Anna Violet will be illustrating it. If you’d like to commission Anna to really put you on the map with a bespoke sketch of your premises, the rate is £200.